Google’s Ngram viewer offers scope for some interesting experiments. 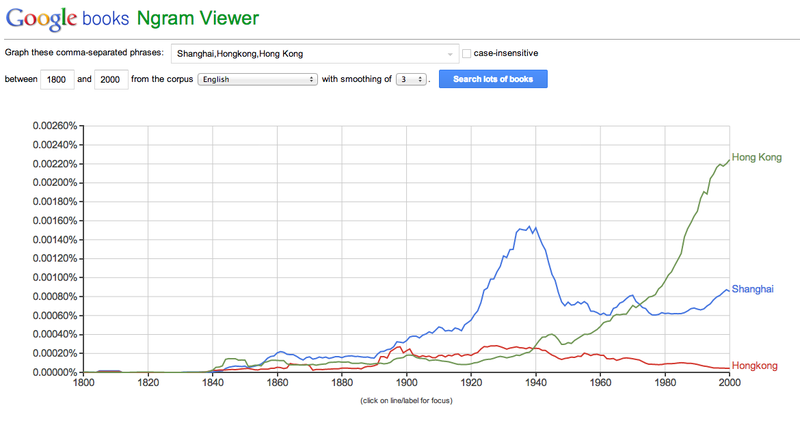 Which city, for example, has had more references in the corpus of English-language books used by the Ngram tool: Shanghai or Hong Kong? The answer is: after a good opening sprint from Hong Kong, which was conceived of as a base for British commercial, diplomatic and military operations in China, Shanghai from 1855 onwards took the lead, and did not relinquish it until 1973. This lead came as its economic role started to overtake the Crown Colony, and then as north China and the Yangzi river were opened to foreign trade and residence after 1858. The key caveat — among others — would be the late 1890s, when a combination of the variants ‘Hong Kong’ and Hongkong would have propelled the British crown colony back into the lead. On the other hand, it is likely that many of those ‘Hongkongs’ will have been in the name ‘Hongkong and Shanghai Bank’. Subtracting those and their linked Shanghais, would probably change things a bit, but the overall trajectory would be the same. Shanghai took over from Hong Kong as the site of key importance to the British (or Anglophone world), and only relinquished it some time after the triumph of the Chinese Communist Party in 1949.